So the time has come at last: the first of a presumed wave of proposals to demolish perfectly good buildings in Wellington. Christchurch has had to put up with a swathe of demolition over the last couple of years, and they are getting so good at destroying everything down there, that they have forgotten that it is not compulsory. Cranmer Courts is their city’s latest disgrace – the Harcourts building is ours. Somewhat bizarrely, the Harcourts building, owned by elderly eccentric Mark Dunajtschik, is not at risk of collapsing in a seismic situation. It has a strong steel skeleton frame, and does not need to be demolished. 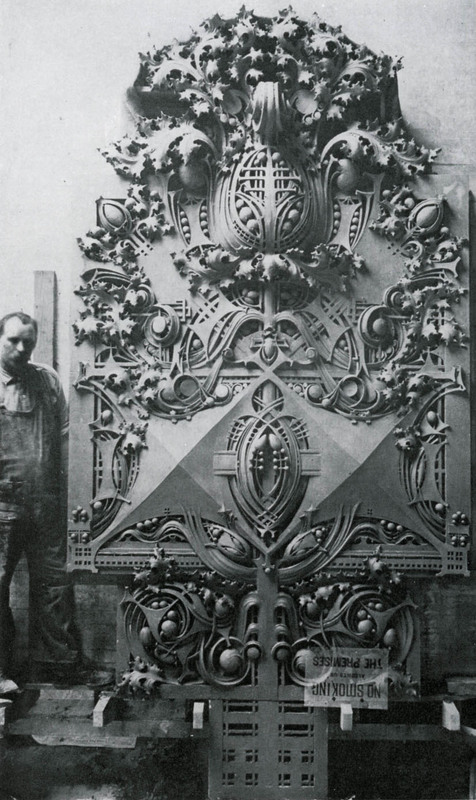 It is a Chicago style building, so we are told, yet has none of the verve and excitement of a Louis Sullivan original, nor the decoration of the facade in the manner that truly befits that name. But the building is there, has been there for quite a while, and doesn’t actually need to be demolished. Instead, there is the chance for bits to fall off in a quake, and as the bits are large, then they could kill. Consequently, Dunajtschik wants to demolish the whole building, and start again – ooh, going up to 25 floors as well. The reason being touted for this work is the cost of earthquake strengthening, but the real reason is that the developer wants to build a bigger building. The sort of thing that would happen in the 80s was that the developer would just start demolishing, and that was that. No asking permission. But here we are in the 10s, and now the public has a chance to partake in the discussion. The developer, Mark Dunajtschik, is of course furious that the public has been allowed a chance for input into the discussion. The public, we hope, are overjoyed at the chance to contribute. The Fish, I think, is here to help facilitate that discussion. I’m not sure if the proposal is just to demolish, or if it includes a proposed replacement yet. The DomPost editorial today advocates that the use of a polystyrene replacement facade be permitted, and that the Historic Places Trust should just pull its head in and stop complaining. HPT presumably thinks that they would rather poke out their eyeballs with a blunt stick than permit a poly palace replica. I’m more worried about Dunajtschik’s track record – the excrescence that is the IRD tub of lard HQ – the appallingly bad Asteron House is not a good precedent for thoughtful and sensitive insertion into the urban fabric. Dunajtschik, of course, is more worried about “the Loony left” and the “fruitcakes” having a say. It’s our city too, Mark! Your thoughts, please? Update: more about the existing building available here. A successful city is one that is buzzing with the activity of people and businesses. Empty heritage buildings do nothing to add to that. I agree the building certainly adds to the street scape of the city. However people seem to over fixate on heritage buildings and trying to keep them forever. This building would have replaced an older building which if it was still standing would also be seen as a heritage building. That building may well have also replaced and earlier building which again if still standing today would be seen as heritage. As a resident of the inner city the issue I have is not that the owner my want to demolish it. It is what replaces it. If they put a quality new building that adds to the life and vibrancy of the city then I am all for it. A city filled with empty uneconomic buildings does nothing for the vitality and success of the city. Trying to find out what is proposed to replace it. Or is the present proposal just to demolish? Surely, the argument must be that any potential replacement should be better than what the existing building is. Info on the existing building on the HPT website is…. sparse. Link added into post above. Info on the proposed building, is available at the Council and the library. Haven’t got there yet! I love the fact that everyone opposed to a 25 storey nondescript office block rammed through a polystyrene pastiche of a heritage facade is a “looney leftie”. I now feel much more comfortable characterising Dunajtschik as an architecturally illiterate money-grubbing right-wing sociopath. I’ve been trying to find this building on the official HPT Register via the HPT website. It appears to have absolutely no entry, and therefore, as such, presumably has no heritage value. So the way would appear to be clear to tear it down. If the officials in charge of heritage can’t be bothered to care about it, why the heck should any of the rest of us care? And that’s it. Apart from the fact it is a similar size to DIC, which is nearby, and altogether more impressive in its design, there’s not too much down on this former T&G building. From letters to the paper today… Evidently this guy knows the true story. OPINION: In response to Kent Duston (Letters, Oct 4), to demolish the Harcourts Building and redevelop the site is not a case of bailing out Mr Dunajtschik – he’s comfortably well-off already. It’s about tearing down an old earthquake-prone building and replacing it with a safe, economically viable modern steel and glass alternative. The building has few redeeming features. It’s made of bricks and mortar and brittle concrete covered in cheap plaster. Nor is it particularly aesthetic in its mock Chicago style. Its heritage building status in the wider scheme of things is irrelevant. From an economic standpoint it’s also inefficient usage of CBD land and air-space. By increasing the height to the same level as the HSBC Building next door, the developer can capture a much bigger floor area to better accommodate Wellington’s growth prospects. After all, the city has to grow, or why would we be promoting organisations like Grow Wellington? Our developers do a great job of revitalising and rejuvenating the city’s buildings and ensuring Wellington remains a vibrant and dynamic urban hub, which we can be proud of. OPINION: Property developer Mark Dunajtschik is a major contributor to Wellington City (Letters, Oct 4). Concerned citizens need to appreciate that the city must renew and intensify itself if Wellington is to prosper. If all old buildings were to be retained, the city would contain no modern buildings. We must get perspective and balance into this debate. Those who continually demand that all of our old buildings must be retained must also bear the responsibility for the uneconomic and unsafe outcomes that ensue. Heritage is vital to our city but it needs to be done well – and it needs to be sustainable. OPINION: If there is a public risk of ornamental features falling off Wellington’s historic Harcourts Building and crushing passers-by (Editorial, Oct 4), I wonder how safe the public will be when the “big one” hits and all the glass from less important buildings on Lambton Quay also rains down upon unfortunate foot traffic. There will be sheets and shards of lethal fall-out. Does The Dominion Post have any suggestions for a ‘balanced solution’ for the non-historic 95 per cent of the building fabric of Wellington’s premier thoroughfare? Living in Wellington comes with inevitable risks when the inevitable happens. Something to think about next time we’re shopping, maybe . . .
Dominion Post editorial from 4 Oct.
OPINION: Wellington has many wonderful heritage buildings that add to the city’s character and charm. However, it also straddles a major seismic zone, and many of those buildings could be death traps in an even moderate earthquake. The unfortunate reality is that the cost of strengthening some of them will not be economically viable. A balance has to be struck between preserving historic sites, the commercial facts of life for their owners and public safety. The dilemma facing Wellington property developer Mark Dunajtschik is one that will confront many owners of heritage buildings in the city. 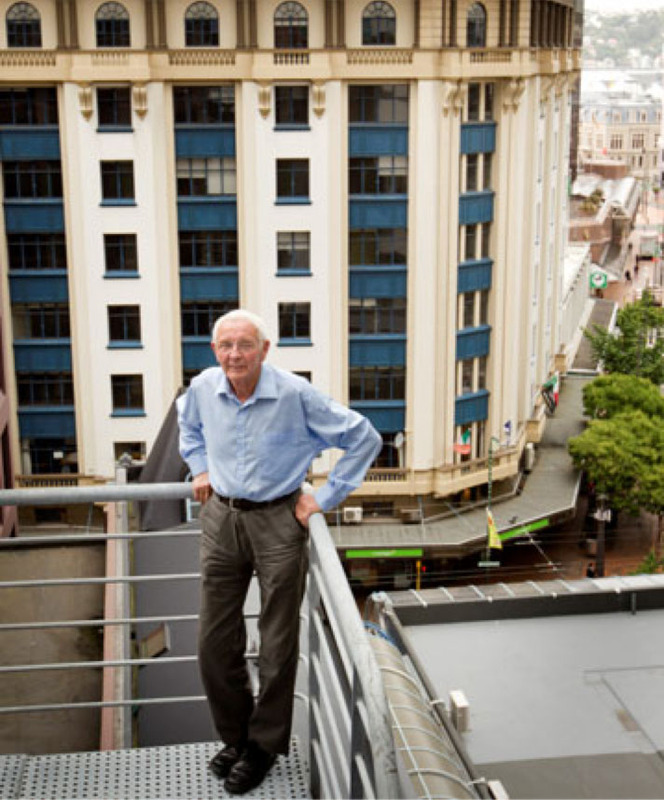 Mr Dunajtschik owns the Harcourts Building on Lambton Quay, which is listed as a category one heritage building by the Historic Places Trust. It also poses a significant earthquake risk. Although steel-framed and not expected to collapse, the building is adorned with many ornamental features that could fall off and crush passersby in one of the capital’s busiest streets. Mr Dunajtschik says the estimated cost of strengthening the building is $5 million. But at the same time, it has fallen in value from $20m to $22m before the Christchurch earthquakes to about $12m today. The earthquake risk has also made it impossible to find new tenants, and seen the annual insurance bill soar to more than $147,000 on top of the $250,000 a year for rates. Mr Dunajtschik says the cost of earthquake strengthening the building makes it economically unviable. He wants to demolish it and replace it with a 25-storey building that is fully up to code, but the council has decided his application should be publicly notified. The council has taken the correct approach. The Harcourts Building is an important part of Lambton Quay’s streetscape, and its future is a matter of public interest. However, the council must be wary of debate dragging on for too long. The building might be of historic and architectural significance, but it is first and foremost an earthquake risk. Opponents of the proposed demolition must also recognise the commercial realities. Landlords cannot be expected to pay crippling sums to strengthen buildings that do not provide a worthwhile return. Those who object to the loss of such buildings are free to club together to buy them and pay for the work themselves. So too are the council and Historic Places Trust, though with an estimated 800 buildings in Wellington in need of earthquake strengthening, many with heritage values, the cost would soon run into the hundreds of millions. There is a possible solution that could please both sides. Mr Dunajtschik has offered to replace the building’s elaborate masonry facade with a lightweight replica made from composite materials, including plaster-coated polystyrene. The Historic Places Trust has knocked back that plan as it would result in the destruction of the building and the craftsmanship and materials which make it of such significance, but the trust has suggested there are alternatives. If the building is to go, there is surely room for compromise on how some of its character can be preserved. All of which is patently untrue. The building apparently has a steel frame, which means it is not about to collapse, and the main issue is that it has ceramic tile cladding, which needs to be seismically restrained. While it is not particularly rich in Chicago-style imagery, it does tie in well with the building nearby (DIC) and the pair relate well together. Its a great “background” building. The real question is: does anyone love the building? Enough to want to save it? Time to farewell old sweethearts? Heritage buildings nationwide increasingly face the wrecking ball as owners grapple with quake-strengthening costs. “Figures from the Historic Places Trust show there has been a rise in applications to demolish heritage-listed buildings this year, excluding Christchurch. Trust chief executive Bruce Chapman said the increase was not statistically significant but he was expecting more quake-prone heritage buildings to be demolished in future. Tougher strengthening rules after the Canterbury quakes and a more safety-conscious market would put financial pressure on owners of quake-prone heritage buildings, he said. The pressure would be particularly acute in Wellington, where quake-strengthening standards were tougher and there was greater earthquake awareness, he said. It was critical to save the most significant buildings and introduce incentives such as tax breaks and flexible zoning. Property firm KPI Rothschild owned more than a dozen heritage buildings in the Christchurch central business district before the quake on February 22 last year. Most had now been demolished and all but one of those left faced an uncertain future. Director Dean Marshall said he would buy a heritage building now only if it was above code or there was a clear, cheap plan to strengthen it. Owners of quake-prone heritage buildings were already under pressure, facing sky-rocketing insurance costs, increased regulations and difficulty attracting tenants, he said. Property Council chief executive Connal Townsend said it was inevitable many heritage buildings would go but more resources needed to go into protecting the “gems”. Earthquake Engineering Society chief executive Win Clark said too many owners went straight to demolition without realising there were methods to affordably retain their buildings. Trust figures show 12 applications to demolish heritage buildings this year, nine of which were quake-prone. However, being quake-prone was the primary reason for demolition in only three instances. Another two buildings in Ashburton, and one in Gisborne, were demolished because of quake damage. Other buildings were demolished because of neglect or to make way for new developments. In the year before the earthquake, 2010, there were seven demolition applications for heritage buildings, with only one building pulled down. The figures exclude Christchurch, where it is expected about half the 150 heritage buildings in the central city have been, or will be, demolished. The trust estimates there are 20,000 quake-prone buildings in New Zealand, 3000 of which have some sort of heritage protection. Mr Chapman said it was untrue that heritage buildings were less safe, with many older strengthened buildings performing better than new buildings in the Christchurch quakes. Wellington’s Harcourts building could become a flashpoint between developers and heritage advocates. Property developer Mark Dunajtschik’s five-storey building on Lambton Quay has been deemed an earthquake risk. He says it is too costly to fix. The solution, he says, is to demolish it and build a 25-storey commercial block. But the 84-year-old building is listed as heritage category one, the highest level of protection. OPINION: Well-intentioned Wellingtonians rushing to defend the right of the Harcourts Building to survive on its historical merit might consider the reports so far produced. The Historic Places Trust has commissioned heritage and economic assessments. All support demolition. The latest, in August, by renowned heritage architect Jeremy Salmond of Auckland, is the least equivocal. He wrote the HPT conservation plan for the building in 1999, which encouraged its preservation. In 2012 he says “forget it” – Christchurch has forever changed the game for certain structures. He says such is the potential threat to life both within and outside this property that its preservation can’t be supported on heritage or economic grounds. He concludes the case for demolition is so conclusive that no purpose is served by public notification. Wellington City Council has ignored that. Yes, I know owner Mark Dunajtschik. He’s possibly the capital’s greatest silent philanthropist. He refuses public acknowledgment of decades of generosity. Typically, he will follow whatever process the rules now dictate. He seeks no special treatment, just common sense. It’s perhaps the absence of that that he finds so distressing. 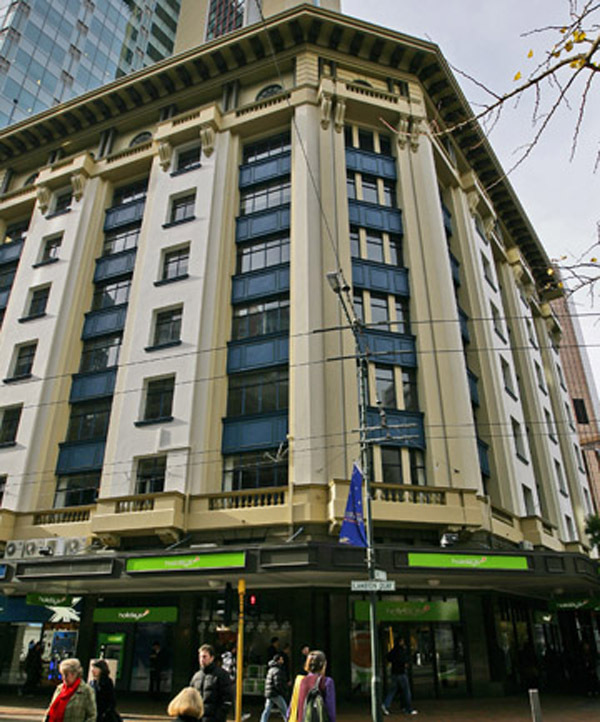 OPINION: Property developer Mark Dunajtschik has applied to Wellington City Council to demolish a category 1 heritage building on Lambton Quay. It was valued at $20 million before the Christchurch quake, and is now claimed to be valued at $12m, with a $5m estimate to earthquake- strengthen it. He contends it’s not economic to strengthen and wants to pull it down to build a 25-storey high-rise. If it’s uneconomic to strengthen, why did he buy the building in the first place? Did he just accept the risk for himself and his tenants, hoping the “big one” wouldn’t strike? The big one did strike, of course, in Christchurch, and Wellington tenants don’t want the risk, so the building lies empty. Why have heritage classifications if they can be brushed aside by developers when their bets don’t pay off? Why should the council, which represents all Wellington’s citizens, not just shortsighted developers, bail him out and allow this beautiful building to be demolished? The council has no obligation to Mr Dunajtschik. If the building’s not economic to strengthen, as he claims, he can sell it at a price that another developer sees as economic. That’s called the free market. If Dunajtschik is such a fantastic philanthropist and all-round generous soul – as Chris Gollins claims – why does he insist on referring to everyone who disagrees with him as loony lefties? Surely he knew the commercial risks when he bought the Harcourts building; from all counts he’s an astute and successful property developer. It seems much more likely that he’s simply someone else trying to privatise his profits whilst socialising his losses – hence his question in the original DomPost article about who will pay for earthquake strengthening of the building. The answer is obvious: him. He’s the owner, he bought the building in full knowledge of its history, construction and HPT rating. So if he’s genuine in his philanthropy, then he should be sticking his hand in his pocket and treating the building appropriately, rather than attempting to run a bulldozer through it. Kent, I couldn’t find your original letter to the Dom online – feel free to repost it here if you wish – although from memory your note here covers most of that. Interestingly, though, I have heard form other sources (un-named at this stage), that Mr Dunajtschik is actually indeed one of Wellington’s greatest philanthropists when it comes to the arts – but that unlike some others, he gives on the basis of anonymity, rather than notoriety. The complete opposite of Terry Serepisos, if you will. OPINION: I am finding it difficult to be sympathetic to Mr Dunajtschik’s desire to demolish the Harcourts Building. The issues it faces – being a masonry-faced building in an earthquake zone – have been self-evident since it was built in 1929. Given the information about the building and the requirement to upgrade have been well known to Wellingtonians for decades, it’s hard to believe that Mr Dunajtschik didn’t take them into account when he purchased the property. His claim that it’s uneconomic to upgrade and must be demolished therefore only holds water if he paid too much for the property in the first place. If it needs $5 million of strengthening, then he should have done his research and paid $5 million less than the asking price. But it appears that Wellingtonians are being asked to sacrifice another piece of the city’s heritage to bail a property developer out of his poor commercial decision. That’s an overly simplistic view isn’t it? At the time the property was purchased the building was admittedly in the same condition but no one could have predicted the massive increase in insurance costs or aversion of tenants from buildings which are seen to be earthquake prone. Yes, the property is the same, but Christchurch was definitely a game-changer for tenants and landlords alike.